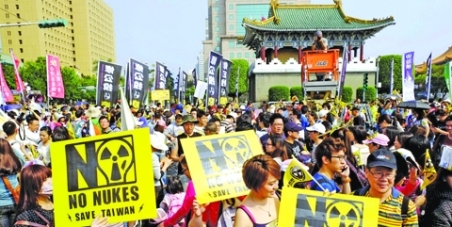 Taiwan continues construction and use of nuclear power plants. Here's the problem: Taiwan is at high risk of earthquakes, of possible resultant tsunamis and of typhoons. All of Taiwan's nuclear power plants/reactors are susceptible to damage from earthquakes, tsunamis and typhoons. The potential radioactive fallout from damaged nuclear power plants presents real danger to the population of Taiwan. Two of Taiwan's nuclear power plants have been rated as two of the three most dangerous nuclear power plants in the world. 170 to 380,000 evacuated from within 30 km of Fukushima Daiichi. 4.5 to 5.5 million living within 30 km of Taiwan's northern nuclear power plants. 82 km evacuation zone around Fukushima Daiichi recommended by the U.S. Nuclear Regulatory Commission. 6.9 to 10 million living within 82 km of Taiwan's northern nuclear power plants. The Fukushima evacuation zone raises the issue of what would happen during an evacuation in heavily populated northern Taiwan during a nuclear accident. If there was a threat of a radiation leak, the government does not have the capability to evacuate the entire area that would be at risk. 4.5 to 10 million people, in heavily populated northern Taiwan, could be exposed to radioactive fallout from a nuclear accident on a similar scale to that at Fukushima Daiichi. Operating nuclear plants is not the safest way to generate energy and carries the risk of causing irreparable consequences. Economic and social costs of a nuclear accident would have a significant impact on part or all of Taiwan. 4.5 to 23.2 million people would be affected by a nuclear accident. 23.2 million is the total population of the island. The costs, to date, of the Fukushima nuclear disaster have risen to hundreds of billions of dollars (US$). With far greater numbers living within 82km of Taiwan's northern nuclear power plants, the costs of Fukushima only represent a fraction of the costs of a similar disaster in Taiwan. Nuclear power is not the cheapest source of energy, considering the cost of disposing of nuclear waste, decommissioning a plant and cleaning up the construction site. Added to this, Taiwan is not in a position to handle nuclear waste. Many safety issues have been discovered at the fourth nuclear power plant during its construction, issues compounded by the fact that Taiwan Power Co (Taipower, 台電) is not experienced in integrating components, made by different companies, for the plant. Concerns that the operator has withheld information about safety violations have been raised and there is a general lack of confidence in the government’s regulatory mechanisms. Taiwan's commitment to reduce carbon and greenhouse gas emissions is laudable and important. From one perspective, nuclear power may seem to be the answer to carbon and greenhouse gas emission reduction. Taiwan also imports much of its energy resources. Again, nuclear power may seem to be the answer. However, since Taiwan is in such an earthquake and tsunami hazardous and typhoon prone location the dangers of continued operation of nuclear power plants outweigh the benefits. Alternative and renewable sources of energy are available and continue to be researched. Use of solar energy, for example, poses a much, much smaller risk of irreversible consequences. Taiwan is the second-largest producer of solar panels in the world. Taiwan's government has already promoted and invested in use of renewable energy. Dedicated continued investment and development in this sector creates the opportunity for employment in green jobs and for Taiwan to take a leading position in energy technology and production. Nuclear disasters, such as that in Fukushima, can be avoided. The welfare of the entire population and life on the island of Taiwan is at stake. The current Taiwanese government, as well as future governments, would do well to commit to a nuclear-free Taiwan. This is an issue that not only concerns those living in Taiwan. This issue concerns all global citizens. Like that in Fukushima, the cost to life and the socioeconomic cost of another nuclear disaster is unacceptable. Continued construction of nuclear power plants and their subsequent operation, as well as continued use of operational plants, in Taiwan, can be stopped. Shine a light on Taiwan. Take this issue beyond Taiwan's shores. Give support to the health and well-being of your fellow citizens. Share this petition with everyone you can. This is an issue that not only concerns those living in Taiwan. This issue concerns all global citizens. Another nuclear disaster is preventable. Together, we can put a spotlight on Taiwan, work towards a victory of cancelling the completion and operation of Taiwan's fourth nuclear power plant and end the use of nuclear power in Taiwan. After all, that would be better than Taiwan basking in an atomic afterglow. Let President Ma Ying-jeou (馬英九), Premier Jiang Yi-huah (江宜樺), current government ministries, bureaus, councils, the AEC (行政院原子能委員會) and Taipower (台電) know that the world is watching.